If you want a walkthrough of asana basics, you may want to read my earlier post first. If you are ready to explore what is new, just keep reading. It is important to understand how workspaces are defined in asana. They are independent containers for projects, tasks and contacts and each workspace comes with its own team calendar. When I first reviewed asana, from the perspective of individual task management, I bristled at my inability to drag and drop tasks and projects across workspaces. I concede that it makes sense for a team collaboration app to have sealed, self–contained workspaces—it is a key feature in regulating project access and permissions. On the other hand, project parameters do change in the real world and asana’s hard line on keeping workspaces separate can mean rebuilding information in a new workspace where dragging and dropping could have done the job. This could maybe be a setting that users can toggle on or off in the account settings if they have proper authorisation? you can save a project as a template. 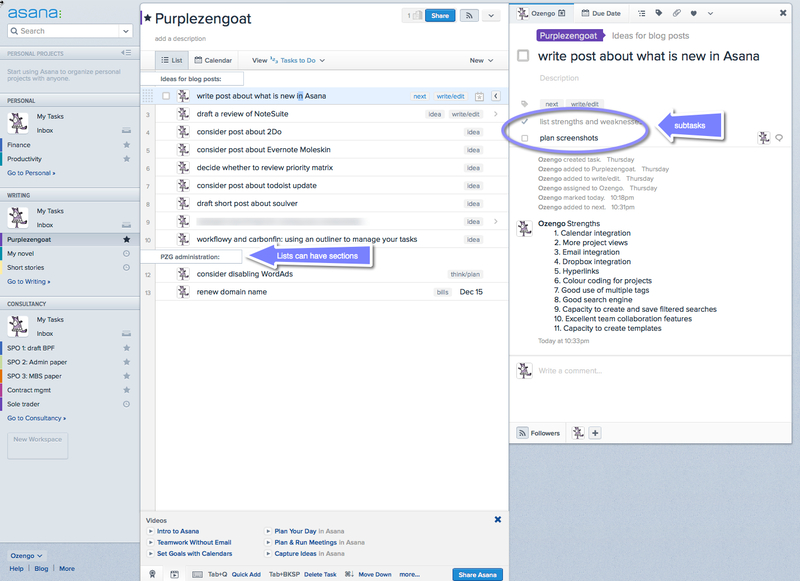 Asana’s project view, with the navigation pane on the left and the task details pane on the right. And, of course, the old features are still there: good email integration, hyperlink navigation, well–executed tags, drag and drop (within each workspace), plenty of keyboard shortcuts, mobile apps and excellent online documentation, including several videos. Asana is also compatible with David Allen’s Getting Things Done® (GTD®) approach to productivity. Best of all, the app is still free for up to 30 users. development of a native iPad app. There is a fluidity to using asana that is most pleasing. As a sole operator, it is easy to plan and re–prioritise your day’s work. Teams using asana can easily allocate tasks, review priorities and manage complex projects, with asana largely replacing email, notes, file management, individual task lists and status update meetings. This is a wonderful product from a gifted bunch of people—with a different badge on it you’d be paying top dollar for this level of quality. Have you used asana? Let us know what you thought of the app, and what features you would like to see. This entry was posted in productivity and tagged asana, calendar integration, email integration, free software, GTD, productivity, project management, team collaboration, to do app by Gilbert Van Hoeydonck. Bookmark the permalink. I beg to differ. Asana has outstanding design, but in terms of features its way behind even free competitors, like Bitrix24, not to mention paid alternatives like Wrike. Why can’t Asana have even half of the features Bitrix24 comes with? I love Asana, I have 8 big projects in it and I loved the collaborational part of it. I will have to move though, leaving only one project in Asana- and only for the collaboration with three coworkers. The deal breaker for me is that Asana doesn’t provide offline access. I’ve been _at_ them for this and I do understand their standpoint, I just don’t agree. I travel a lot, often to Eastern Europe and there can be long hours without wifi, roaming costs a fortune, so I went off to Todoist and their Premium option. Works like a charm. I own a Mac, iPad, Nexus 7, Android smartphone and iPhone, and Todoist has a native app on each platform. Asana? No way, and their third part app for the iPad isn’t good enough. Sorry to be negative here. I highly appreciate your time and effort on this blog. Very good writing! Thanks for your feedback, Dragan – much appreciated! And I agree that Todoist is pretty impressive.